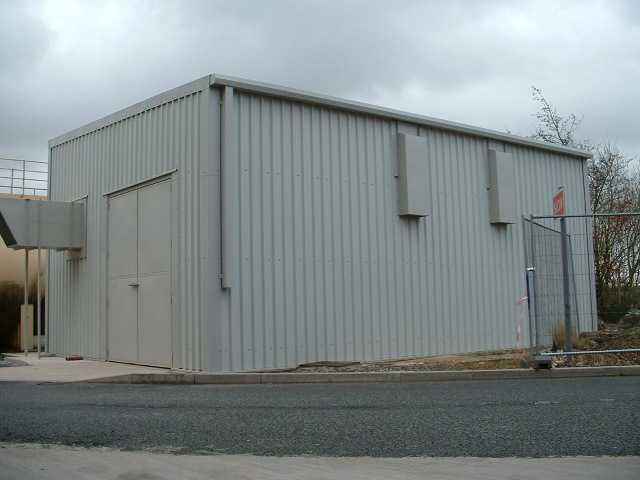 An acoustic housing for the `Nitrogen Pressure Swing Absorption System (Comprising of one air compressor, one booster compressor and one PSA unit)’ installed at a UK based manufacturing and assembly facility operated by a global defence, aerospace and security company. To design, manufacture, deliver and install the required acoustic housing, this being of approximate overall dimensions 10m long x 7.5m wide x 4.5m high. To be fit for purpose in providing the necessary noise reduction to neighbouring residential properties in accordance with BS4142, structurally sound, weatherproof, capable of withstanding the relevant wind & snow loadings for prolonged periods without damage, and with a minimum design life of 15 years. Designed to meet Building Standards, having a structural steelwork portal frame of a `stand alone’ design (i.e. 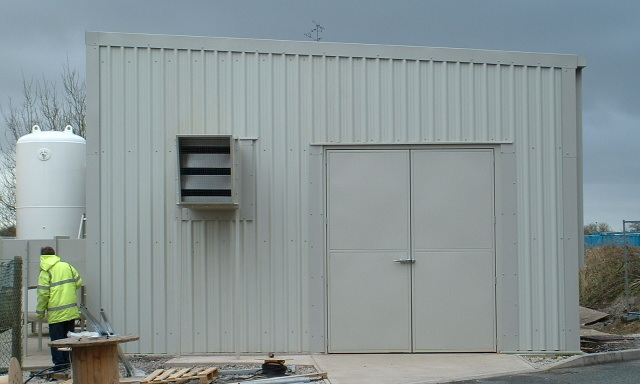 without dependence on panel / cladding for structural integrity) with additional subframes around doors & service(s) penetrations, galvanised & paint-finished, ready to accept & integrate with all PSA plant & equipment. Acoustic panels to walls & single-pitched roof over-clad to provide full weatherproofing, with rainwater run-off to predetermined drainage points, inclusive of guttering, downpipes & accessories, all finished in the end user’s corporate colours to be both aesthetically pleasing and harmonious with nearby buildings. Forced extract ventilation system with separate air inlet & outlet attenuators to the Air and Booster Compressors plus a roof-mounted silencer / PSA Vent (complete with all ducting & transition pieces etc.) ensures that the temperature rise inside the enclosure is acceptable and allows the equipment to operate in a normal manner whilst maintaining the overall acoustic integrity of the housing. All powder-coat finished to match external cladding. 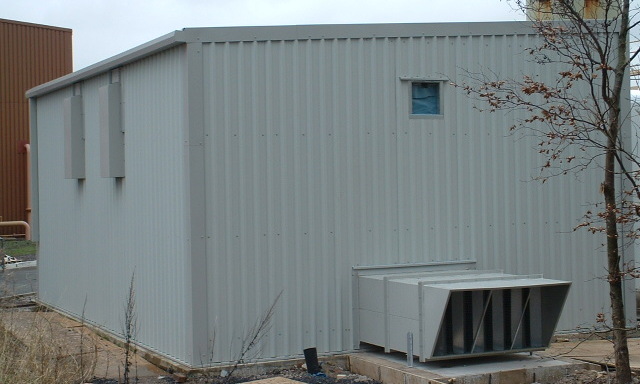 The Acoustic Housing supplied in flat-pack form for site assembly by our skilled operatives onto prepared foundations (over and around the existing gas handling equipment) following stringent risk assessments & method statements to complete the installation work in a safe & timely manner. The `PSA Plant' had an operational noise level of 100dB(A) at 1 metre, and due to the close proximity of a number of residential buildings, the ambient background noise level of 53dB(A) at the site boundary, just 8m away, was 'not to be exceeded'. In addition to the main build, particular attention was given to the ventilation system to ensure that the completed installation fully met (and exceeded) the customer's requirements, thereby avoiding complaints from local residents.